Before being diagnosed with celiac disease* I was in a “no man’s land”. Maybe you’ve been there too. It’s the place you end up when you don’t know what is making you sick and no one – including doctors – knows how to help you. It’s not a fun place to be. Back then, even though it was not clear what was making me sick, I must have subconsciously known it had to do with food. I simply felt better when I didn’t eat! Clearly we have to eat to live so this was not sustainable. Regardless, I got into the habit of skipping breakfast or only having coffee or a latte. To be more precise, the Triple Venti Latte (usually with an extra shot) at Starbucks was often my breakfast of choice. Instructions: Place all ingredients in a blender and process until smooth. **Coffee should be room temperature at least but for a thicker shake it’s best to freeze coffee in ice cube trays and use those instead of the coffee and ice. Thanks for stopping by! Find Paleo Spirit on Facebook and Pinterest. 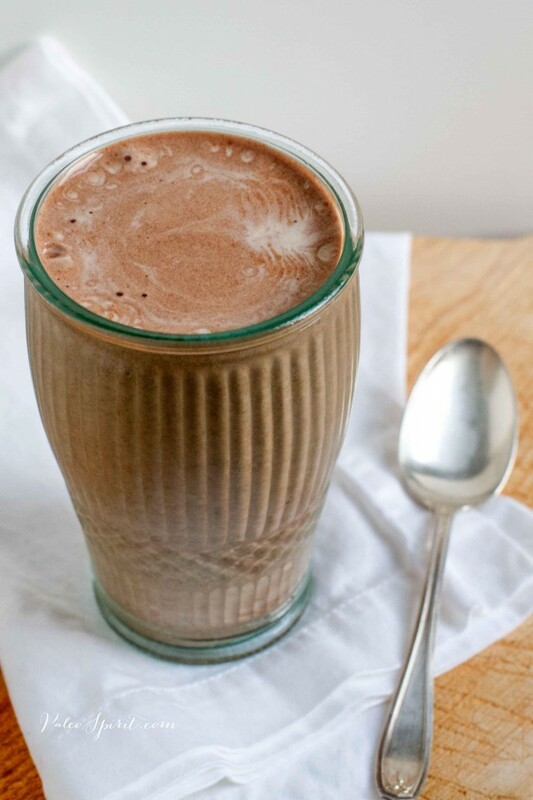 14 Responses to "Paleo Banana Mocha Shake"
This looks great Lea. At first I thought it would be a recipe with coconut milk, which I react to, but I thought I’d read anyway as I love your post. I am so glad I did. It’s ingredients I can tolerate!! Now I have to go and buy some bananas. I think I have monkeys living in my house. Every time I buy bananas lately they just disappear. If I were not on whole30 right now, I’d be making this. So I shall have to wait until september. It looks really refreshing. Tried this for a lunch break today. Good stuff! 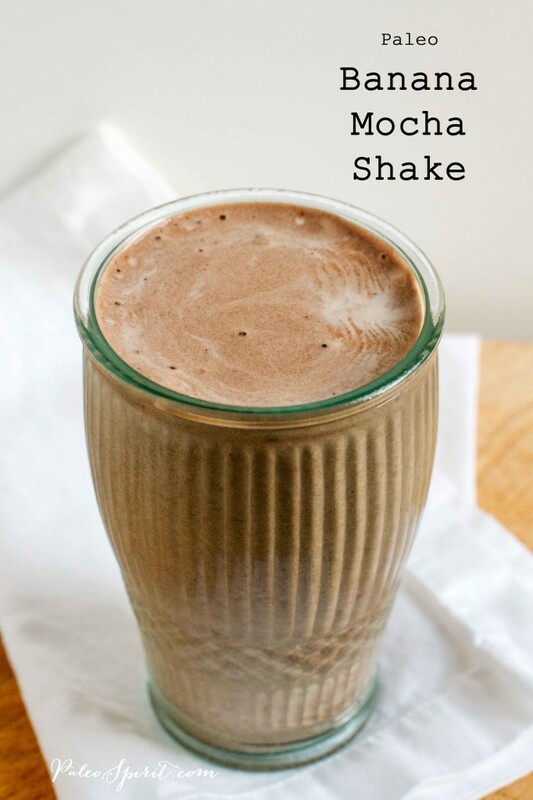 Try using this shake to wash down a couple of slices of bacon and you’ll forget about eating eggs with it ever again. Lea, what do you think about glucomannan powder, as a thickener in recipes and as a weight loss tool in general? I’ve never heard of it before so I’m afraid I can’t offer an opinion – will have to look it up. What is coconut butter? Is it the same as coconut oil? Hi Nicole, Coconut butter is made by blending (in a food processor or high speed blender) unsweetened dried coconut flakes. Unlike coconut oil which is just the fat of the coconut with no solids (liquid when warmed), coconut butter actually contains the flesh of the coconut in addition to the oil. I buy it from Trader Joe’s but you can also make it yourself at home. Supposedly you can’t really use fresh coconut meat – it really needs to be the dried, unsweetened flakes if you can get that. I hope that helps. Thanks so much Lea! Appreciated! I think i’ll go the easy route and buy it from TraderJoes! What is the exact type of coffee you are using? ie, instant coffee, plunger coffee? I used very strong coffee I made using a French Press. Just made this shake for breakfast, it was amazing! I used coconut milk instead of coconut butter, skipped the honey. It was so good it I cried a little when I took my last sip. Had it with paleo breakfast meatballs- not missing my former carb loaded breakfast even one bit! Awesome! I’m so glad you like it. You’re right, bagels sort of pale in comparison to breakfast meatballs and a banana mocha shake. New to the paleo lifestyle, and I know my husband is missing his coffee drinks. This was amazing. He doesn’t even like bananas, but you can barely tell it’s even in there.